Tracey lives in England, UK. She travels to the big fight nights in Las Vegas and has been attending Floyd Mayweather fights for the best part of 20 years – that’s a lot of air miles. She watches boxing from the United States live and she follows the UK Scene. Last Saturday night saw Adrien Broner in his own home town stop Khabib Allakhverdiev in the last round to win the vacant WBA Title. There is now a man waiting in the wings getting ready to take the new title away from Broner and he goes by the name of Ashley “Treasure” Theophane. Ashley was born on 30 August 1980, an English professional boxer from Kilburn, London who now lives and fights out of Las Vegas under Mayweather Promotions. Ashley’s career started at the famous York Hall, Bethnal Green, home to boxing in London’s East End and he fought at other venues in London as well as Germany and in the US in his early career. On the 19 February 2011 Ashley won the British Title at Wembley Arena and was now spending his time training between London and New York sparring with Dmitry Salita, Steve Williams and Liam Walsh. Ashley had been training abroad since August 2005 and the inspiration and love of the sport has come from watching the great “Iron” Mike Tyson back in the day. One of the gym’s Ashley’s trained at in New York is Gleason’s Gym and he’s highly respected there at the Brooklyn Gym. Some of the greatest fighters ever to lace up boxing gloves have walked through the doors of Gleason’s gym. Muhammad Ali, Mike Tyson, Larry Holmes, Roy Jones, Marvin Hagler, Pernell Whitaker and Julio Cesar Chavez to name a few have all trained there. Ashley has sparred world champions Joan Guzman, Elio Rojas, Yuri Foreman, Paul Malignaggi, Argenis Mendez and countless world ranked fighters at Gleason’s. For his big fights except his fight against former world champion DeMarcus Corley, he’s had a training camp at Gleason’s gym. But Ashley found British boxing uninspiring and when British boxing closed its doors to Ashley, the US opened theirs…………. Ashley first went to Las Vegas when preparing for his fight with Steve Williams but that fight never took place as Steve pulled out injured but the two weeks he spent at the Mayweather Gym was such a great experience he went back a year later. 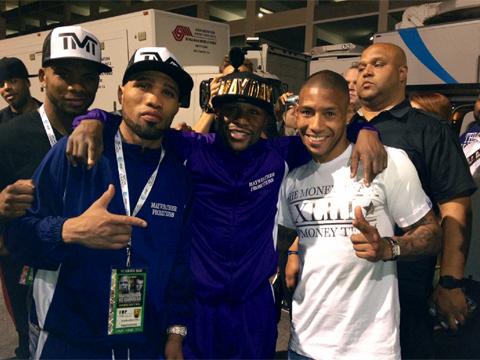 Ashley trained alongside Floyd and watched his intensive training sessions. Many sessions were and still are closed to the public and Ashley was taken under the wing of the Mayweather Promotions fighters as one of their own. Floyd Mayweather went onto outbox Robert “The Ghost” Guerrero at the MGM Casino &Hotel in Las Vegas on 4th May, Ashley was personally invited by Floyd and given three $1,500 tickets. He would return to London the day after the fight but with “Boxing dead in the UK” Ashley headed back to Las Vegas. Not before a two-week stop off in New York City as former world champion Luis Collazo had requested Ashley for a sparring session. Luis could easily have used a boxer from New York or someone from the States but the high regard in what Ashley was held Stateside, he was flown in from London, England. Ashley was offered a promotional deal from a New York-based promotional group but he had a vision and Las Vegas was the place he felt his dreams could become reality. Floyd Mayweather, the richest sports man and number 1 boxer was a fighter who respected Ashley’s hard work and Floyd was a fighter who undoubtedly inspired Ashley to “be the best he could be”. I heard a while ago about a potential fight with Ashley and Broner and I see that on Saturday night Broner has called Ashley out. Let’s hope Mayweather Promotions can make the fight. Despite fighting out of Vegas Ashley still has fans here in the UK. Here’s hoping we’ll be saying ……And The New……in the very near future.